Genghis Grill donates to “Spread the Love.” Pictured are the Genghis Grill team with Mayor Stan Pickett. 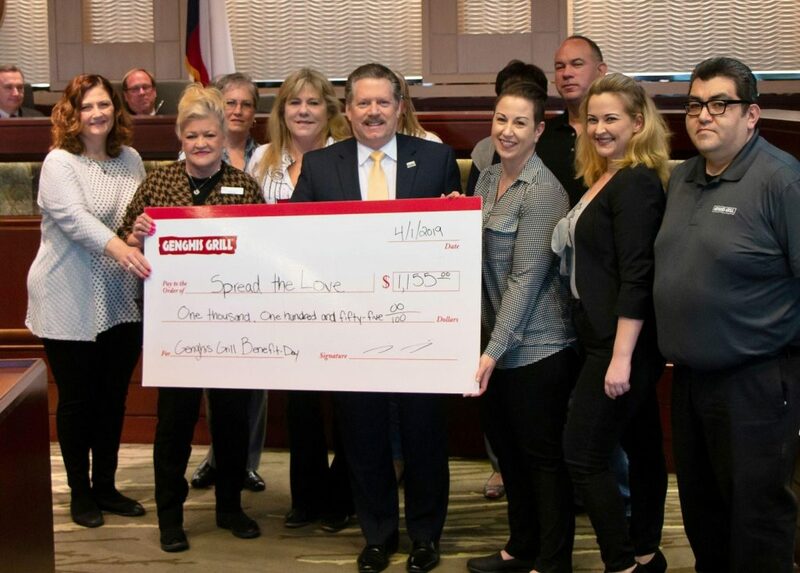 The City of Mesquite launched its annual “Spread the Love” food drive at the April 1 City Council meeting by accepting a donation of more than $1,100 from Genghis Grill in anticipation of National Peanut Butter and Jelly Day on April 2. The food drive accepts donations of funds as well as peanut butter and jelly. The program helps feed children in food insecure families during the summer when free or reduced school lunches are unavailable. Recently, the newly remodeled Genghis Grill, located at 1765 N. Town East Blvd., pledged to donate 20 percent of sales from one day to the Spread the Love program as part of a re-grand opening. All program donations are distributed between the two food pantries in Mesquite, Mesquite Social Services and Sharing Life Community Outreach. Visit cityofmesquite.com/SpreadTheLove for more information.